My two favorite things about Christmas, in this order, are FOOD and MUSIC. There are 3 records that are my absolute favorites to listen to at Christmas time. I don’t listen to our own Christmas records, mainly because they remind me of work, and when I listen to music I just want to chill out. Here are the absolute MOST AWESOMEST of ALL TIME Christmas records. YOU WILL NOT BE DISAPPOINTED. Buy this record now. It is melancholy and warm and fuzzy and arty all at the same time. What could be better? 2. I’m a SUCKER for this record. 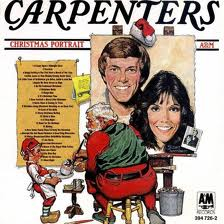 Carpenters. Best one. Nuff said. A must in any Christmas music lovers library. 3. I worship Vince Gill’s voice. LO-OVE. It doesn’t hurt that he is the nicest person in the world. Or at least in Nashville. 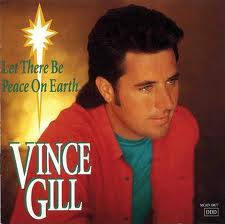 Anyway, this is an older Christmas record of his, and I got it a super long time ago when I first moved to Nashville. I distinctly remember listening to it in my condo on my little jam box and it always put me right in the Christmas spirit. And that’s what a Christmas record is supposed to do. He does a little duet with his daughter Jenny, who is all grown up now, but it is really sweet. You will love this record. I love his green shirt with a red shirt over it. Classic. I hope you enjoy me editing down the massive amount of Christmas music available to the 3 finest…. I am currently on the road to Baltimore as I type this. We are on our way to our next stop on our “Home for the Holidays” tour. I think this drive is about 13 hours from Chicago. 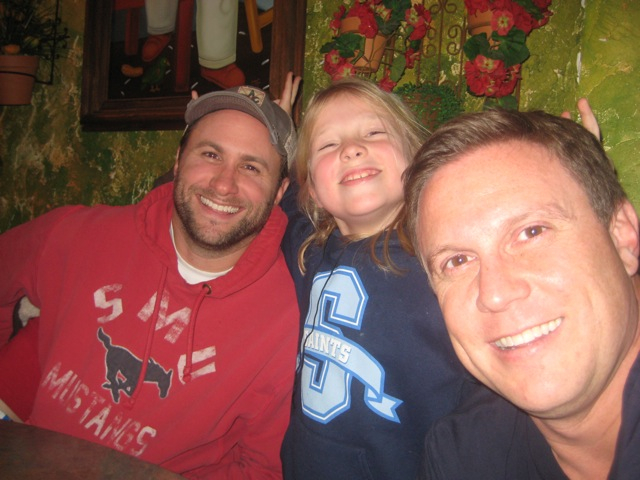 I realized yesterday that I never did the second installment of Meet My Road Family. We only have 3 shows left and it has been a blast. I will really miss these hard working folks!! This beautiful girl is DeMetri Moon. She goes to Trevecca Nazarene University and is an awesome fiddle player. She has been a blessing to us on this tour. Not only does she play the fiddle and study faithfully on the road to keep her grades up, but she also does Caroline’s and Darby’s hair every night. They LOVE her. And we do, too. I saved this guy for last. This is Dana. If you have seen us in the last 15 years, then you have seen him. He is our Mr. Everything. 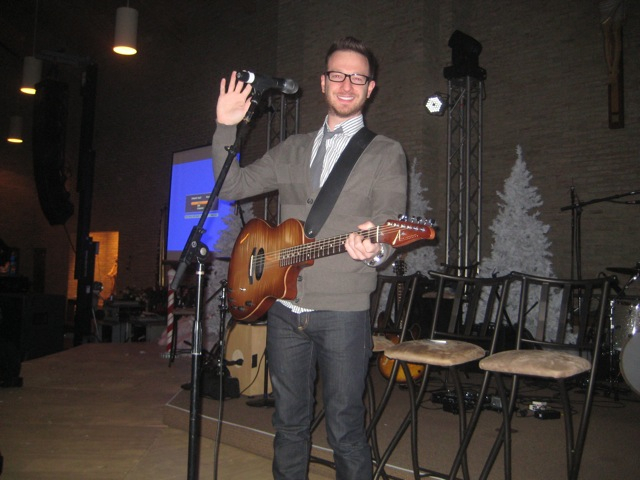 Guitar player, road manager, merch guy, and most importantly our biggest fan and encourager. 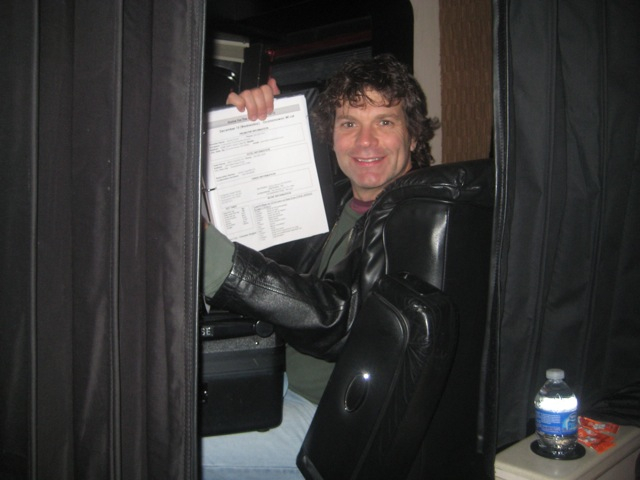 He has so many jobs on this tour-I’m afraid we might just kill him. Pray he lasts for 3 more days! 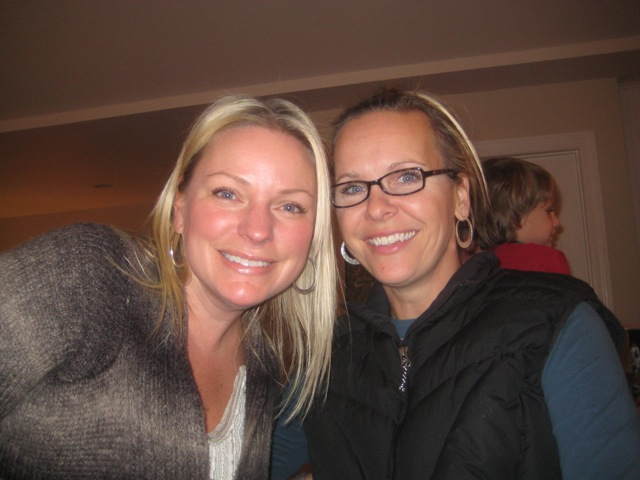 Big love to you, Dana!!!!! On a serious note, which I don’t do often or well, I am blessed to love the people I travel with. It would be a long lonely road if I didn’t. We laugh a ton and encourage one another along the way. So a big thank you to all of my road family. You all are the best. 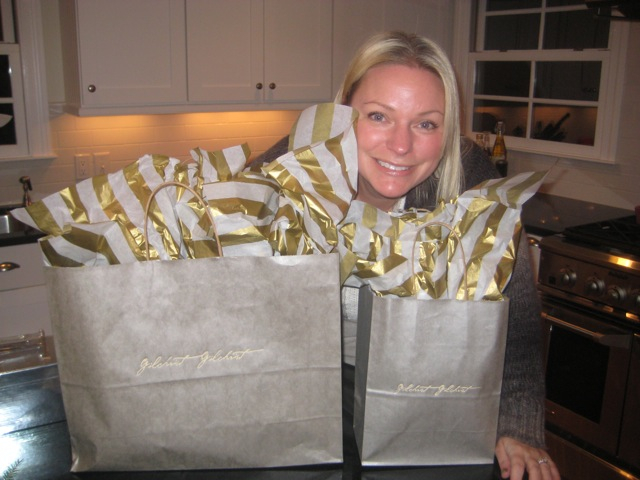 Stay tuned tomorrow, where I will share with you my all time favorite holiday music and movies…. OK, so check out this cute t-shirt we have. 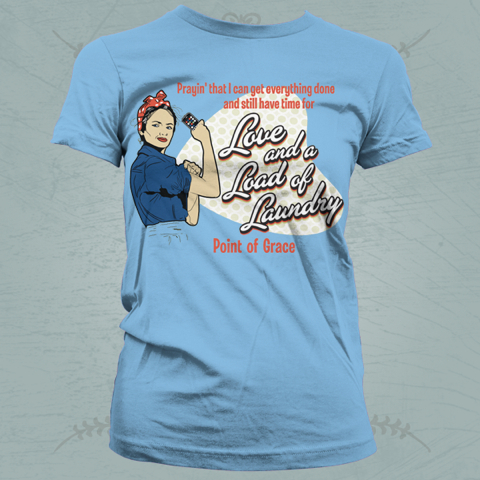 Many of you are familiar with our “busy mom” song, Love and Laundry…I’m gonna show you the “retro” looking shirt first. I love this chick on here showing off her guns. It’s 15 dollars. It comes in blue and green. It has a cute more fitted cut. Translation…shelley wears an XL. I told you it was cute. She has an iphone in her hand. Just so you know, none of us in POG have an iphone. We are in a life imprisonment contract with Verizon. OK, I know we have other Christmas records, but this is our BRAND SPANKING NEW ONE. 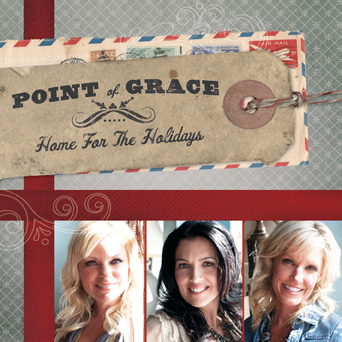 “Home for the Holidays.” Little known fact-we recorded it live at Reba’s studio this summer in 3 days. You would think that would have saved us time, but we practiced for weeks in advance, so I’m not sure it did…but it was a great experience. This is 9.99 on the website. OK, I swear this is really cute in person. We don’t have a “REAL” picture of it, and this one looks weird with the “bosom” drawn in like that. (I mean who really looks like that…)But Denise had one and it was really cute. I was going to take a picture of it and show you, but she just told me she lost it. She said it’s white with a chocolate brown logo and design. This drawing cracks me up…I’ll leave it at that…. I just like the cover, so I wanted to show it to ya’ll. Pretty sure it’s 9.99, too. And last but not least, we have a little bargain bundle. 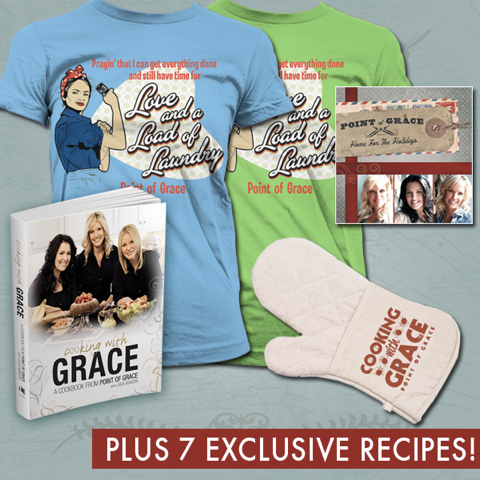 You get either a blue or green Laundry shirt, our new Christmas CD, our new cookbook, a little oven mit, and 7 new recipes that we gave especially for this package. They are recipes that aren’t in the cookbook! New ones. This pack is gonna run ya 44.99. 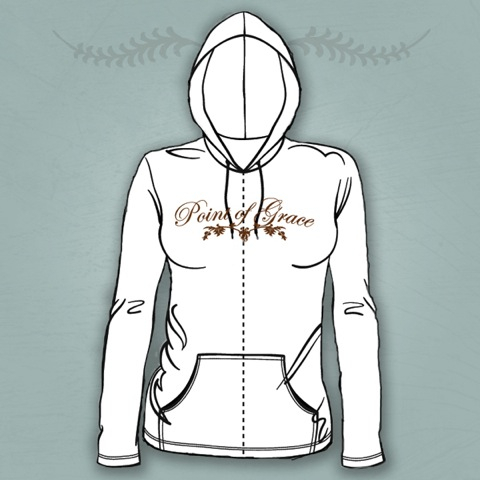 OK, so leave the traffic to someone else, and click on over to www.pointofgrace.net to finish your Christmas shoppin’! Hurry. And buy a lot. Caroline will be in college before you know it. So we met at our house at 5:45 to exchange gifts (in the long-standing tradition of the Howard’s it was 6:15 when they came), and David got a new remote helicopter. That is Caroline, Dave, Kirsten and Ben. Isn’t he the cutest. HE LOVES CANDY. You really don’t understand how much. You never could. They try to monitor his intake, but I let him have as much as wants at my house. He loves me. Below is Dave flying his new helicopter. Look at Bella at the bottom. She’s confused. 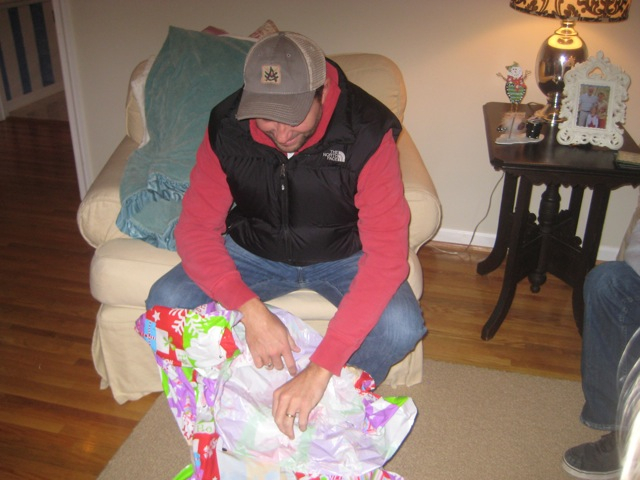 Here is Mister Rob opening his present. I also got him a hot dog bun steamer like 3 months ago, but I couldn’t find it anywhere. I’m sure it’ll turn up. He works at Denise’s church. One of the big cheeses there…..you can follow him on twitter at @howardrm. So, on the left here is this really cool calendar that stands on an easel and all the months artwork are hand drawn with little beads or glitter. So cute. It will look great on my desk. Once you have the stand, which I do now, you just replace the calendar every year. On the right is this big glass jar that looks kind of old and antique-y. I’m either going to fill it with soaps and put it in my bathroom, or maybe red and white candy at Christmas…not sure yet. 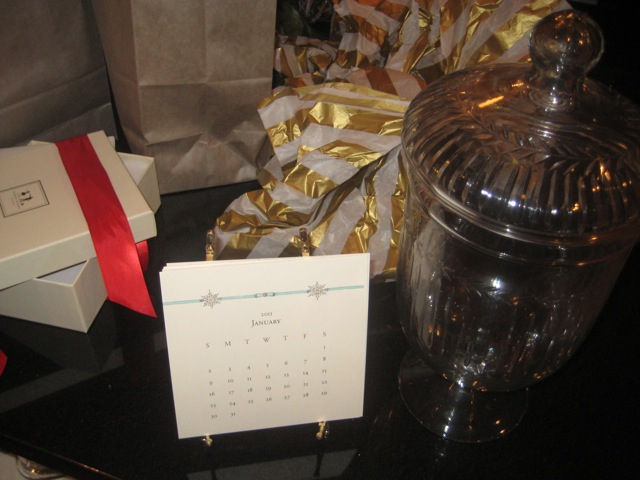 I love the versatile gift! I loved my presents!! I wish you could see the jar better….it’s bigger than it looks and so cool. 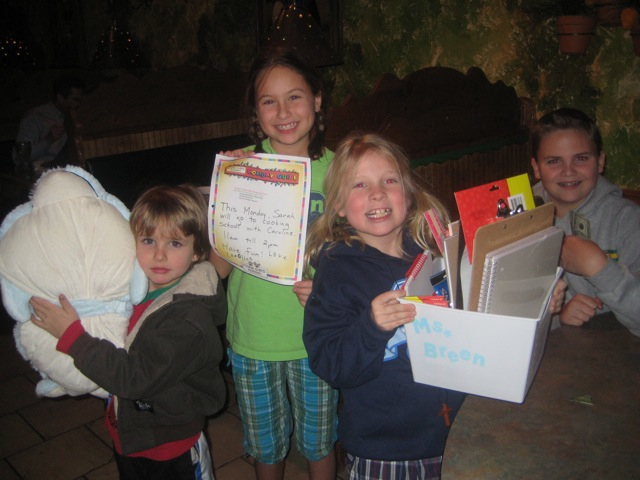 After gifts we went to eat Mexican food, because that is truly the tie that binds. Chips and Salsa. 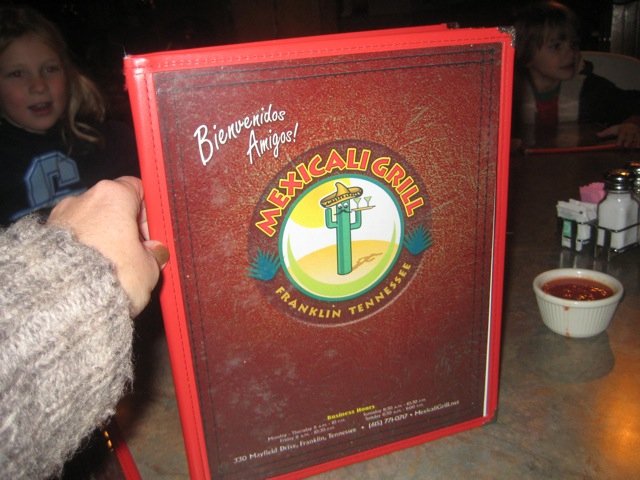 Mexicali Grill. It’s kind of like “Cheers” to the neighbors. Where everybody knows your name. 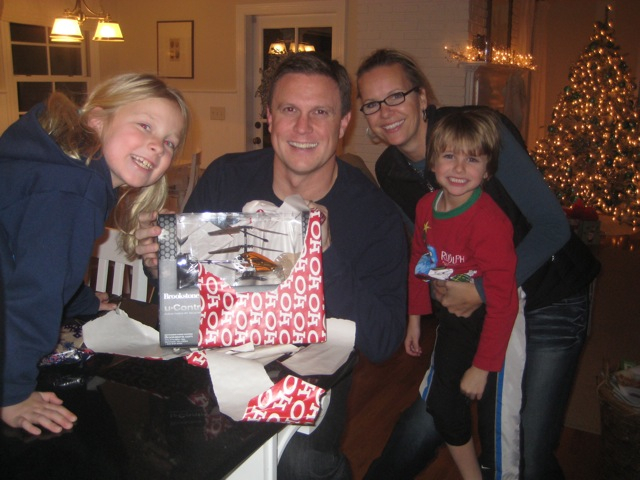 I got my usual number 43 chicken…..
Ben got a whale pillowpet, Sarah got a gift certificate for Young Chefs Academy, Caroline got an incredible “teacher’s kit” which she has not stopped talking about since last night, and Caleb-well he wanted what every 13 year old boy wants-cash. So that’s what he got. Alrighty then, so that was our framily Christmas. Do you have awesome neighbors?? Write and tell me about them! PS You are welcome to use the term “framily”. It has not yet been trademarked. But we are working on it…. 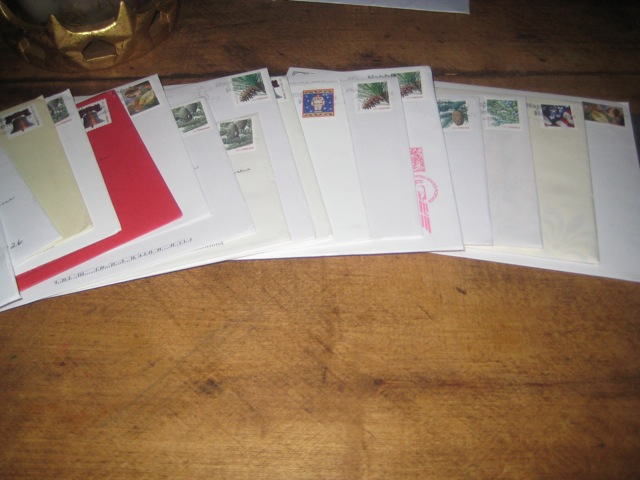 So I finally finished addressing our Christmas cards a couple of days ago. I ordered 180, and I totally should have ordered more. We are completely out of them, and I keep remembering more and more friends everyday that I didn’t send one to yet. Shoot! I take my card seriously, and was going to actually have my friend Keely come take our family picture back in November but canceled our “shoot” at the last minute. I ended up just pulling a few of my favorite photos from our year, and ordering a card off of Shutterfly. It was right before our tour started, and I just couldn’t add one more thing to our calendar. Especially one that involved me putting on make-up of any kind. So here is our card. I’m posting it because it is highly likely that you didn’t get one. Because I’m a doofus and didn’t order enough. But I love you and David and Caroline love you, and even Bella loves you. And you are totally worth 44 cents. The pic of Dave and I was at this incredible restaurant called Caliza that we ate at during our vacation to Florida. The family one is from the same trip to Florida on another night, and the one of Caroline is from Disneyworld back in September. 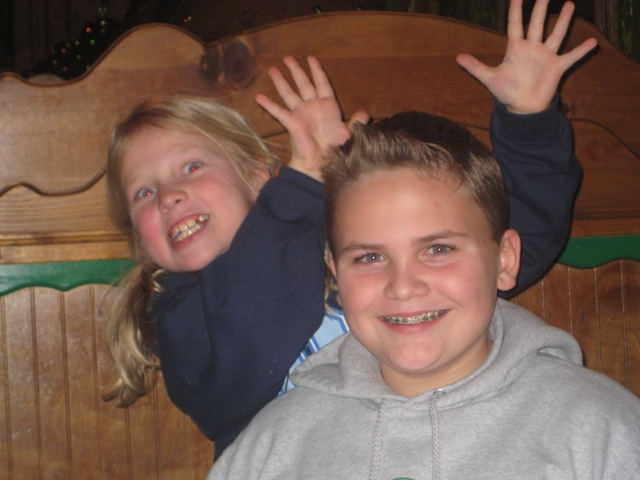 I’m pretty sure I cropped Lilo and Stitch out of that one. And then of course there’s Bella in the fall leaves. 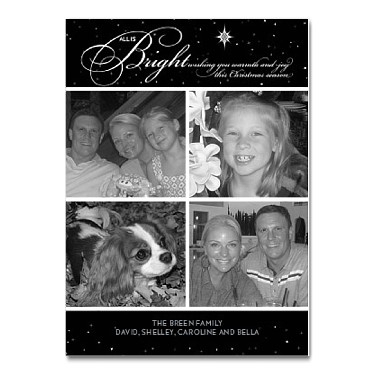 I thought the black and white card would be cool, but honestly it was just ok. I’m just glad I’m done addressing them. I have quite a few cards that I haven’t opened yet. I really like to take my time and read them, so I’m waiting until I have time! Maybe next week when the tour is over. 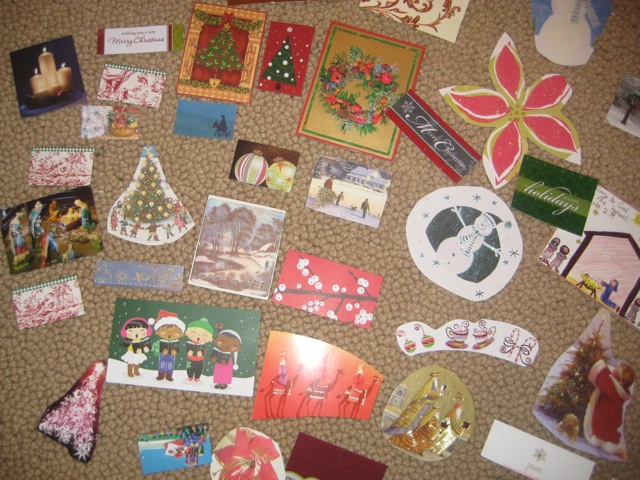 After Christmas I always recycle my Christmas cards. I save all the picture cards and leave them hanging up for quite awhile on my pantry door. (which I haven’t even STARTED hanging them up there yet this year!) 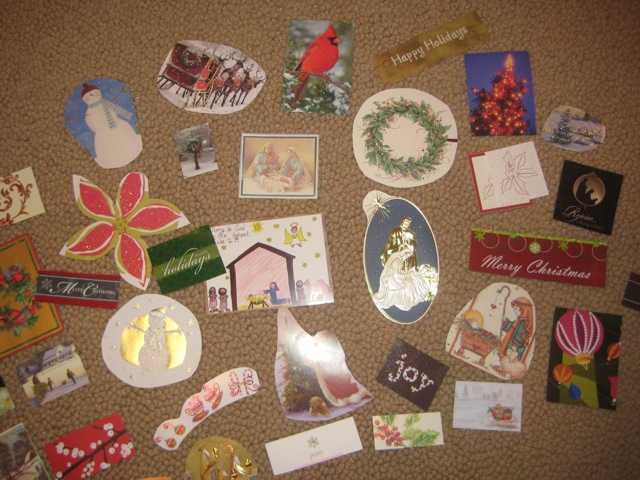 But I “repurpose” the non-picture cards to use as gift tags for the next year. I just cut out whatever the main picture or design is, and when I need a gift tag, I just find one in my bunch that looks good with the paper, use a hole punch to thread the ribbon through, and WALLAH-a gift tag! Here are the ones I cut out last year from my cards. I’ve already used a ton of them this year when wrapping. This is all I have left actually. Just write “to” and “from” on the back side and you’re good to go. I can’t even believe I take time to do this, but there is something oddly therapeutic about it. It’s as crafty as I get. Lame-o. But it saves me at least 5 or 10 bucks on gift tags. Just enough for a coffee and two cranberry bliss bars at starbucks. 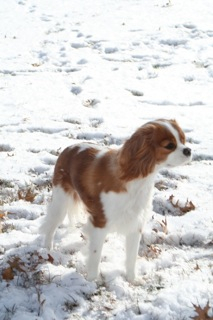 We pulled into Nashville this morning for a day off, and came home to a beautiful blanket of white. As I write, the kids are sledding down the street with the reddest cheeks I’ve ever seen. This whole scene makes me happy. 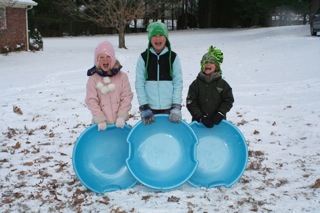 Don’t you remember being a kid and how much you LOVED a SNOW DAY! 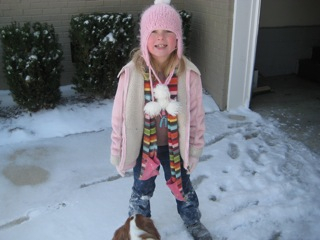 I had to beg Caroline to pose for this right before she came inside because she was certain she had frostbite. Now we are all warm inside drinking hot chocolate with our neighbors and watching “Mickey’s Twice Upon a Christmas” which I actually love myself. I made them put that blanket on the floor so I wouldn’t have hot chocolate on my rug. Isn’t Bella cute? And the kids too, of course. Just a few random thoughts and things I also wanted to mention from yesterday. 1. A HUGE THANKS TO MICHAEL PASSONS, our keyboard player, (you can follow him on twitter @mpassons) who saved me (and this blog actually) with his kindness yesterday. We had to change planes in Dallas to get to Shreveport. There was an earlier flight we could catch so we ran to the other gate two terminals away. Right as we were boarding the plane, our road manager got a call on his cell phone. Guess who left their computer on the other plane?? Yep, me. That’s right. So Michael offered to stay behind, go retrieve my computer, and take the next flight to Shreveport. He also got to eat at the new Pappasito’s in DFW, which was a slight consolation in the matter. Ummmmmmmm, nope. Not sure I see my size available in that pic. 3.Also at FBC Bossier– the church was decorated to the nines. 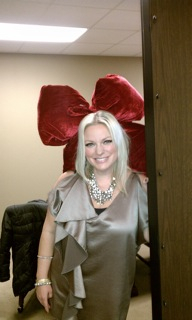 They had these HUGE red velvet bows everywhere. There was one in the conference room next to our dressing room. I picked it up and acted like it was in my hair. The girls thought it was funny, so Michael stood behind the wall, held it above my head, and Leigh took this pic. Random. I don’t know why I think that is funny but I do. 4.So our good friend Kimmie, who actually works for Reba McEntire, but is always a huge help to us whenever we play around town, took some photos at our concert in Nashville the other night. 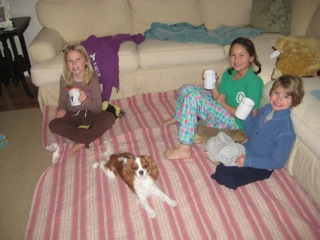 I just have to show you this one of Spence (Denise’s oldest) and Darby and Caroline. I hate that Price isn’t in it, he was on the other side of the stage playing guitar. But aren’t they so cute. Our fiddle player, Demitri, did their hair and they thought they were hot stuff. There is a video of them singing this on my previous blog. Well, how’s that for a mixed bag of goodies. I must go now and reorganize my house and life, because we leave for Wisconsin in about 33 hours. Happy SNOW day! PS Had to add these two pics in fresh off the press. Neighbor just sent me these. Happiness. Our kids are getting so BIG. I can’t even take it. 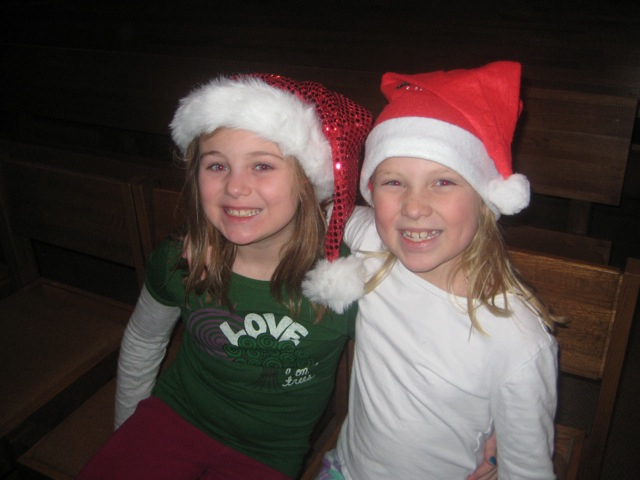 It’s a tradition for them to sing in our Christmas shows. 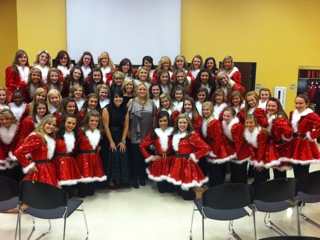 Below is a video of our Nashville show and the kids performing Silver Bells. 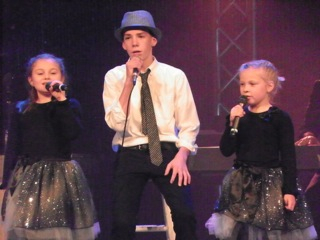 Price is on guitar and Caroline, Darby and Spence are singing. PS thanks to one of my besties in the whole world, Keely, for filming this, and also basically running my blog while she herself is traveling all over the world. Story to follow this week. She is going to get her own dedicated post real real soon.